Status justified, China’s Fan Zhendong and Xu Xin, winners of the Men’s Singles title earlier in the year at the Liebherr 2017 World Championships in Düsseldorf, added to their collection of silverware on the afternoon of Sunday 19th November. 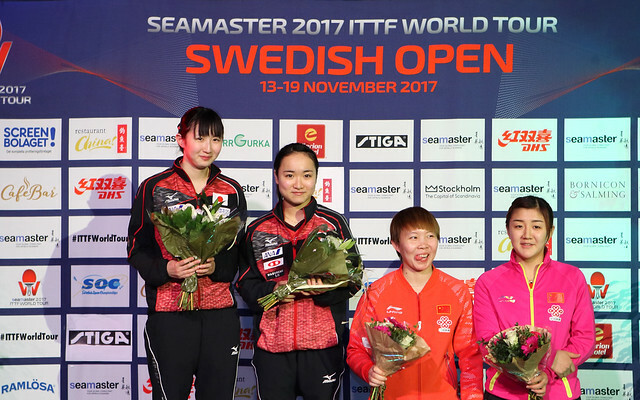 The second seeds, in the final of the Men's Doubles event at the Seamaster 2017 ITTF World Tour Swedish Open in Stockholm, they beat Hong Kong’s Ho Kwan Kit and Wong Chun Ting, the third seeds, in four games (6-11, 11-5, 11-6, 11-8) to arrest the title. The better start, Ho Kwan Kit and Wong Chun Ting secured the opening game but finding a rhythm to their play and able to execute their lethal forehand top spin strokes at will, Fan Zhendong and Xu Xin recovered to establish a two games to one lead. In the fourth game, Ho Kwan Kit and Wong Chun Ting secured a 5-1 lead; was a quite dramatic recovery a possibility? Fan Zhendong and Xu Xin quickly provided the answer. They reduced the arrears to one point at 5-4, Ho Kwan Kit and Wong Chun Ting called “Time Out”, they retired courtside to gain advice from Chan Kong Wah, the national coach. Alas for Hong Kong, the break proved a move in vain, Fan Zhendong and Xu Xin levelled at 5-all, before establishing a 9-8 lead; Liu Guozheng, the Chinese national coach sitting courtside, called “Time Out”. On this occasion, the decision to take a break proved fruitful, the next points were was won, the title secured. It was the second time that Fan Zhendong and Xu Xin had reached a Men’s Doubles final at an ITTF World Tour tournament in Sweden; in 2014 they had been beaten in the title deciding contest by colleagues Wang Hao and Yan An. Notably, overall it is only the second occasion when Fan Zhendong and Xu Xin have won an ITTF World Tour Men’s Doubles title, the one other instance was in 2015 in the Czech Republic.